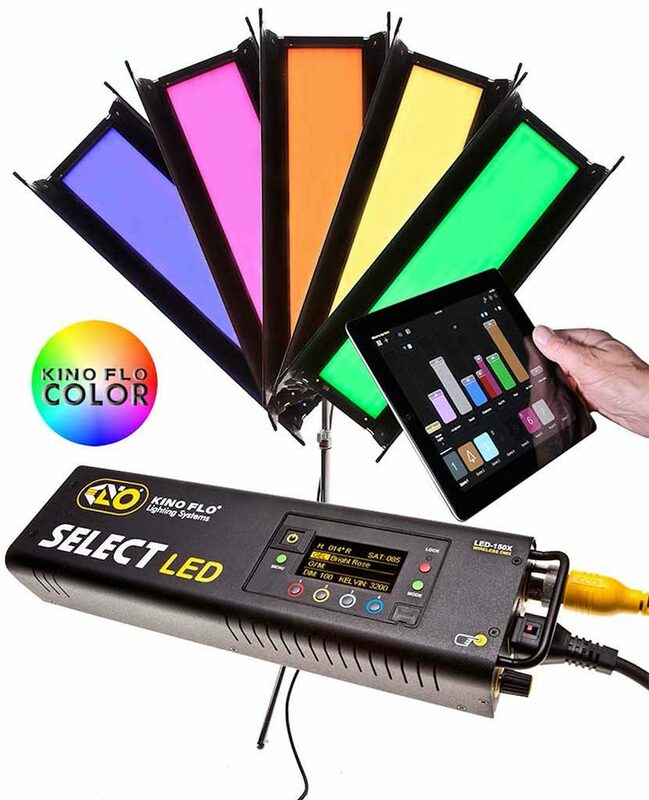 The new Diva-Lite LED and Select LED fixtures from Kino Flo deliver new color lighting options for photographers, cinematographers and other creatives, providing professional cine swatch book presets, as well as full hue and saturation color control. And with the new 2.71 software release, users can preview the full chromatic spectrum at the turn of a dial, or with a single button, recall favorite gel settings. Among the Diva-Lite and Select LED features are white light menus with built-in variable green/magenta filters to color balance to any professional or practical light source. Two display modes provide even more options—the White Light Mode and 360-Degree Color Mode—and both can be controlled manually or remotely via wireless and DMX lighting consoles. The fixtures are available in a variety of kit configurations and case options. BURBANK, CA — Kino Flo has expanded freedom of expression for image-makers. The company’s new 360-degree color system unlocks millions of colors to express mood and feeling frame by frame, shot to shot. New Diva-Lite LED and Select LED fixtures come loaded with professional cine swatch book presets plus full hue and saturation color control. The new software 2.71 release adds a layer of color lighting choices to Diva-Lite and Select LED white light menus. From intense reds to deeply saturated violets, production designers and lighting technicians can sample the full chromatic spectrum at the turn of a dial, and recall favorite color gel settings at the touch of a button. Diva-Lite and Select white light menus come with built-in variable green/magenta filters to color balance to any professional or practical light source on the set. Using the same green/magenta settings, cinematographers are able to map the light quality onto the spectral sensitivity curves of all makes and models of digital cameras, and save the customized profiles in the Diva-Lite and Select LED fixtures. The new 360-degree color options pile creative value onto Kino Flo’s award-winning True Match® white light, lauded for its >97 color rendering and large, soft spread. Users can easily control both the white light mode and the new color mode manually, or remotely via wireless and standard DMX lighting consoles. White Light Mode: Open, unfiltered white light shapes and models subjects for the camera, and reproduces real world colors faithfully. In the white light mode, the mired shift is 2700K to 6500K, and the variable green/magenta control settings eliminate the need for corrective gels. 360-Degree Color Mode: The new color mode unlocks seemingly endless creative choices to express the character of a visual narrative, such as red for anger, or fear; pink for love; blue as sullen, etc. The extended Kelvin range travels from 2500K tungsten to 9900K daylight, and users can select from an exhaustive menu filter color presets or from a color-wheel of RGB values. In addition, Kino Flo has supplemented the standard filter categories with its own proprietary gel color presets, such as Candle Flame, Green Screen, and Sodium Vapor. Combined with an advanced “Smoothing” feature, board operators can rely on stable, flicker-free control from high output, to the lowest light levels. Simply turn off the Smoothing feature to achieve lighting special effects such as a dancing candle flame or the pulsing light of a television screen. The new 2.71 software also boasts a pair of dimming curves, with the square curve providing fine adjustment control at the low end of the dimming scale, and a linear curve to ensure a one-to-one translation of the intensity throughout attenuation. Kino Flo has partnered with LumenRadio® Wireless DMX for the most stable, reliable wireless control systems in the industry. Kino Flo Diva-Lite and Select fixtures have built-in receivers and support up to 512 channels. The fixtures are also compatible with W-DMX™ transmitters. Full control via on-board manual or DMX cable inputs are still available on every fixture as well, as is the auto-terminate feature. The last fixture in a row of DMX fixtures will automatically terminate the DMX return signal. In the DC Mode, the portable Selects and Diva-Lite LED’s operate completely free from an AC power cable. Outfitting and shipping a production lighting package can be rough on LED fixtures without well-built kit options to protect the equipment. Kino Flo Select LED’s and Diva-Lite LED’s are available in a number of kit configurations, and case options. The Select 30 has a couple of different kit styles. The lightweight soft case version includes the complete Select 30 System, and a soft carry bag with tote handles and shoulder strap. The system also comes as a kit with a rolling flight case. A Select 20 System is available in a soft case kit and a flight case kit, and a pair of Select 20‘s are combined in a two-light kit with rolling ship case. The Select 30 System kits come with a choice of soft case, flight case and two-light ship case. 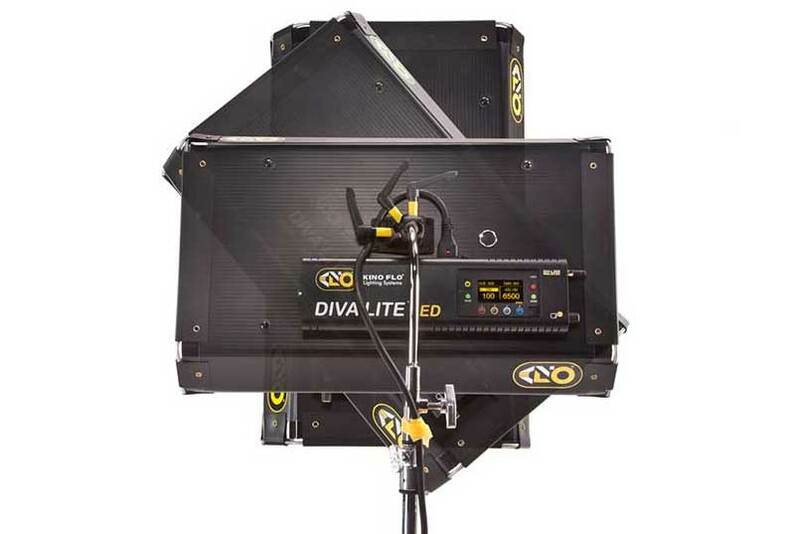 There are five kit options for Diva-Lite LED’s: soft case, travel case or two-light flight case for the Diva-Lite LED 20 fixtures; and soft case or flight case options for the Diva-Lite 30 fixtures. ♦ Built-in LumenRadio® wireless receivers, 100-0% dimming, diffusion panel, focusing louver, barn doors, center mounting. *For full menu of colors, see White Mode and Color Mode mapping PDF’s for Select and Diva-Lite LED’s at www.kinoflo.com.